HOUSTON, June 30, 2015 / PRNewswire / — Marabou Superior Pipeline (“MSP”) is pleased to announce the completion of a 19,000 lf natural gas pipeline, and the commencement of natural gas service to the new Arcadia Sand, LLC (“Arcadia”) sand mine in Arcadia, Wisconsin, capable of processing up to 310 tons of sand per hour. Arcadia is a subsidiary of Mississippi Sand, LLC located in Town and Country, Missouri. This is Marabou’s fourth pipeline serving the burgeoning sand mine industry in Wisconsin. Arcadia contracted with MSP in 2014 for the design and construction of the 6” SDR9 HDPE pipeline for delivery of up to 53,000 Scfh to its dryer. MSP completed the regulatory and right of way work in 2014 before winter set in, and the construction of the pipeline was completed in April 2015. 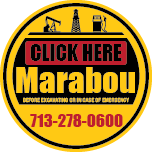 Marabou was responsible for the design and construction of the pipeline, the procurement of any necessary right of way and easement agreements, all required regulatory permits and approvals, negotiation of the upstream interconnect and measurement, and is the natural gas supplier to the Arcadia facility under a long term sales agreement. MSP was formed in 2010 for the purpose of providing natural gas service to industrial customers through pipelines designed and built to suit each customer’s particular requirements; and the construction, acquisition, and operation of midstream oil and gas assets. In addition to its Wisconsin assets, Marabou also owns and operates five gas pipelines in Texas serving asphalt plants and sand mines. For further information see the company’s website at www.maraboumidstream.com or email info@mmslp.com.